Conaway Motors would like to remind customers of the importance of exhaust repair in Mill Creek. As we move into the autumn season, drivers and passengers are more likely to be enclosed in the passenger compartment of vehicles. Cooler weather makes driving with the windows rolled down less pleasant than when the days are warmer. Gases from your engine’s internal combustion processes are normally routed from motor through the catalytic converter and then out into the world. This protects people inside the vehicle from the fumes and also cuts down on air pollution outside your vehicle. As you probably know from watching late night shows where the Victim of a crime has met his or her end by being locked into a garage with a running vehicle, automobile exhaust can be toxic. It includes particulate matter that can lodge in lungs causing damage, carbon dioxide and carbon monoxide. These fumes can enter the passenger compartment through the air conditioning or heating vents or even (in some older models of cars) filter up through the floor boards. While minute amounts might not be immediately fatal in a moving vehicle, exposure over time can cause head-aches, bronchitis, and a variety of long-term illnesses. Repairs can include putting a new seal between the manifold and the exhaust system, repairs to your catalytic converter, or simply patching a hole in your muffler. Once it is done, your vehicle will run better, sound better, and will stop adding unbreathable gases to your passenger compartment. 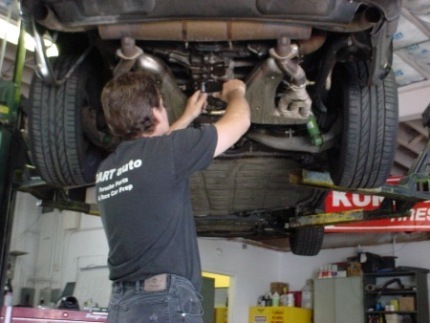 Conaway Motors will be glad to help with your exhaust repair in Mill Creek. If your vehicle sounds louder than usual, or if you are getting an odd odor inside your vehicle while driving, give us a call at (425)905-2424 to make an appointment today.